Delivering life-saving tools could be as easy as having a pizza delivered. Drones are showing up in such a wide variety of fields as of late, with its uses ranging from farming to package deliveries; it seems that people keep on finding new ways to utilize this new technology. Now, they can also save lives. Researchers from the University of Toronto have found a new use for these drones in the medical field. 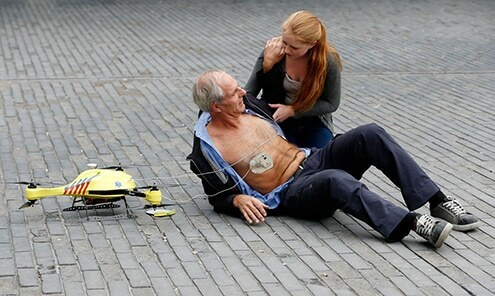 Their idea is to have drones deliver automatic external defibrillators (AEDs) directly to people who have just suffered a heart attack. If it seems familiar, it’s because that it has been done before and their inspiration comes from another drone that does a similar thing in the Netherlands. Justin Boutilier, together with Professor Timothy Chan, Director of the Centre for Healthcare Engineering at U of T, and Professor Angela Schoellig aim to use these drones to save lives by delivering these AEDs directly to people’s homes.